The latest OSATE release can be downloaded from here. OSATE is available for Windows (64-bit), Mac OSX (64-bit), and Linux (64-bit). As a prerequisite Java 8 is required; in the following we assume that it is already installed. See here for help with installing Java. Note: Running OSATE under Java 9 or 10 is not supported and may not work. 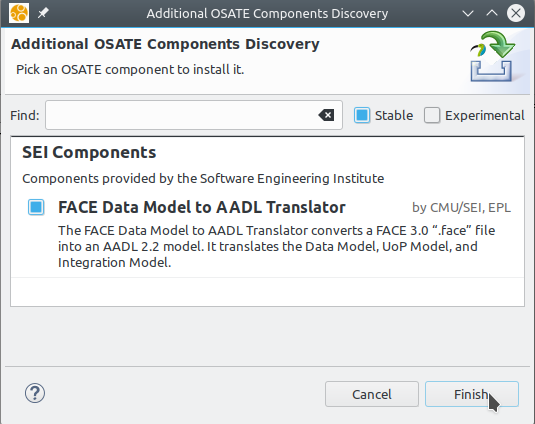 To install OSATE, download the archive file for your platform from the OSATE download site (see below), choose an installation directory and unpack the archive file there. The installation directory contains a platform specific executable (osate.exe / osate.app / osate) that can be used to start the OSATE. On Windows 64-bit Java must be installed to use 64-bit OSATE. To test which one is installed, run java -version in cmd.exe. The following output indicates 32-bit Java. A 64-bit Java will output “64-bit Server VM” instead of “Client VM”. There are several optional components available for installation. 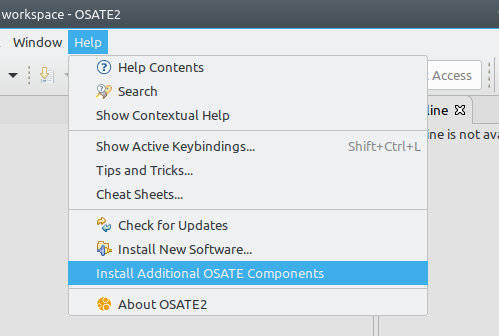 OSATE provides a convenient way to discover the available components and install them via a dialog that is available in the Help menu. This brings up a component installation dialog that displays the available components. To install one or more components, select the component’s checkbox and click on Finish to start the installation. 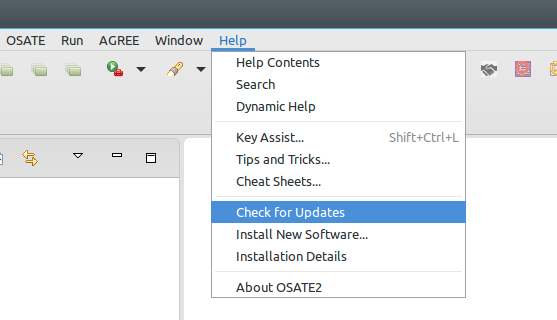 To start the update process, use the check for updates entry in the help menu in OSATE and follow the instructions in the dialog. A new stable version is released every 2-3 months. You can install it from an existing Eclipse installation using the update site or just by installing the complete product. The product is a fully integrated and tailored Eclipse environment with all OSATE functions. The products are available for Windows, Linux and Mac OS X. All available versions can be found at the following locations. The testing version is built on a nightly basis. It includes the latest fixes but also some unstable code related to features being developed. While it might be useful to use it for some projects, please think about using it for production purpose due to potential unstable features.